Leawood, KS – Oct. 24, 2018 – Susan G. Komen®, in partnership with Diagnostic Imaging Centers, P.A., today announced a renewed grant to help provide screening mammography to uninsured women around the Kansas City metro. “We’ve been able to more than double our investment this year, bringing the total to spend on this potentially life-saving screening to more than $59,000 for the year,” said Michael A. Levine, interim executive director of Susan G. Komen Kansas & Western Missouri. The grant is a combination of funds from the Health Care Foundation of Greater Kansas City and a private fundraising event, which earmarked the raised dollars for use on the mobile mammogram coach. In Kansas City, about 60% of women who should be screened are getting their mammogram every year. Increasing the number of women being screened is a goal of both Diagnostic Imaging Centers and Komen Kansas City. Early detection is still our best defense against this disease and for women over 40; mammography is a key part of early detection. 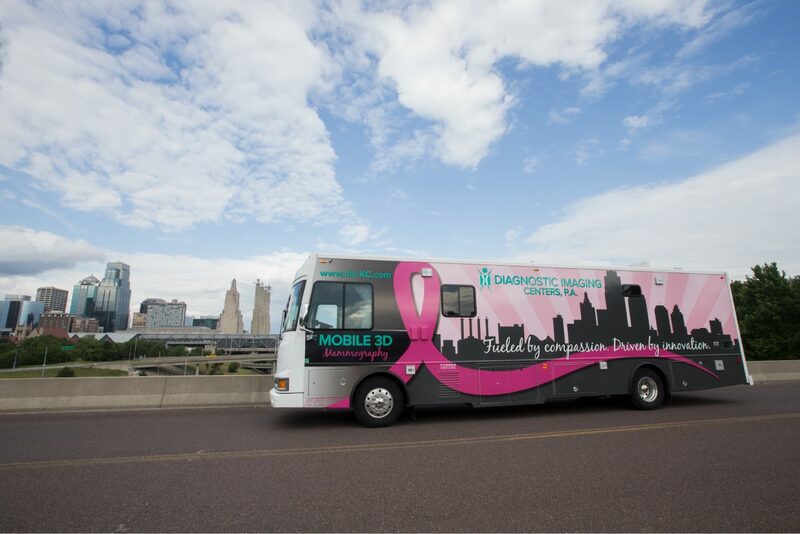 With the mobile mammogram coach, Diagnostic Imaging Centers is able to reach many women who might otherwise not get screened. Bringing the coach to women across our city and beyond addresses issues with time, availability and transportation. With the help of the Komen grant, we are also able to reach women without insurance or other coverage, further breaking down barriers. About Diagnostic Imaging Centers, P.A. – Diagnostic Imaging Centers is a premier radiology group, standing alone at the forefront of the medical imaging industry. It is a physician-owned Kansas City-based company and offers a full range of diagnostic and screening imaging services for patients and referring physicians. For more information, call 816-444-9989, visit www.dic-kc.com. Connect with them on social media: Facebook or Twitter. About Susan G. Komen® Kansas & Western Missouri – Komen Kansas & Western Missouri is working to better the lives of those facing breast cancer in their local communities. Through signature events like the Race for the Cure®, More Than Pink Walk, BigWigs and Rock the Ribbon, Komen Kansas & Western Missouri has invested more than $27.5 million in breast health programs in their 112-county Kansas and Missouri service area and has helped contribute to the more than $988 million invested globally in research. For more information, call 816.842.0410, visit komenkswmo.org or behindtheribbon.org. Connect with us on social media: Facebook, Twitter or Instagram.